The Massachusetts Girls in Trades Advisory Group hosted the Second Annual Career Fair on March 2nd 2017. 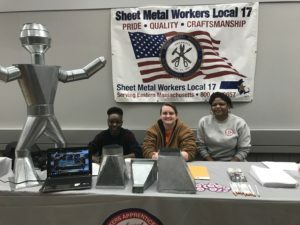 The Massachusetts Girls in Trades Advisory Group hosted the Career Fair on March 2nd 2017. 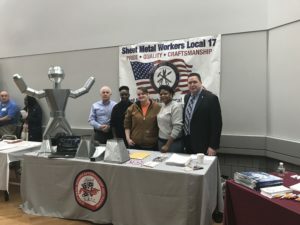 Shamaiah Turner (5th year apprentice- Harrington Air Systems), Caitlyn Pike (2nd year apprentice- Quality Metals Inc.), (Adrian Mobley 1st year apprentice- McCusker- Gill inc, & Frazier Sheet Metal) along with John Healy, Training Coordinator represented Local 17 at the Career Fair. 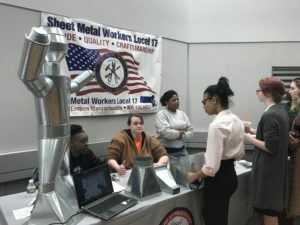 Over 400 female students from 18 high schools across the state flocked to the headquarters of IBEW Local 103 in Dorchester by the busload on March 2, 2017 to attend the second annual Massachusetts Girls in Trades Conference and Career Fair. Also present were 45 educators and 50 exhibitors. 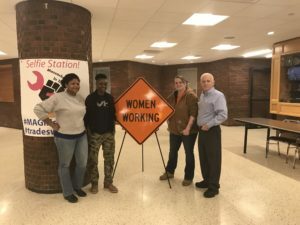 "The Building Trades have a goal to be 20% women by 2020" Brian Doherty, the general agent of the Building and Construction Trades Council of the Metropolitan District.